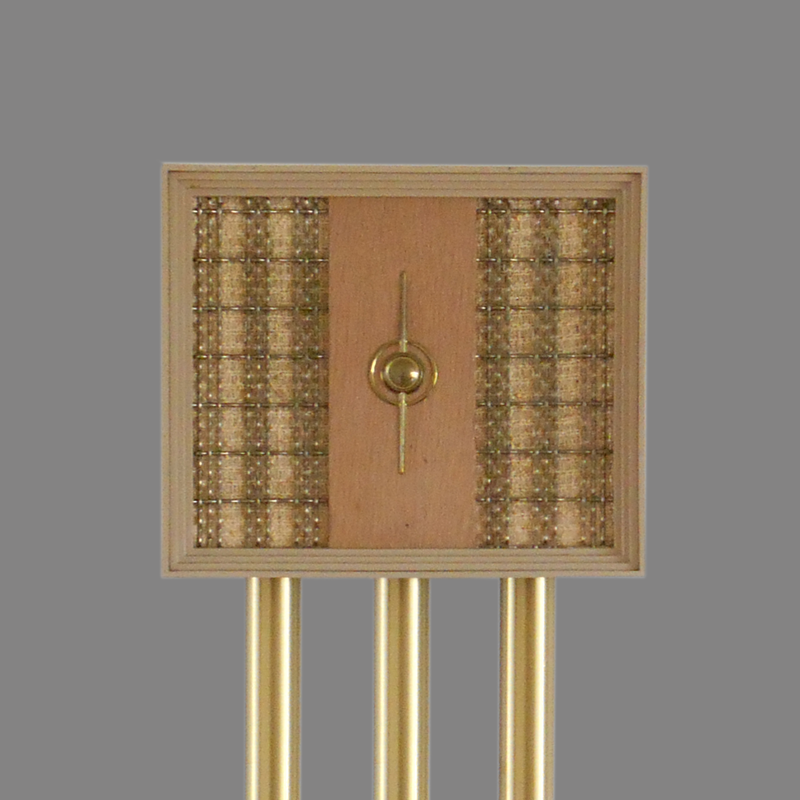 This Mid-Century door chime is from the Troubador Line from Miami-Carey known as the Serenade. The style mimics high fidelity stereo cabinets of the era, similar to contemporary chimes from Rittenhouse and others. 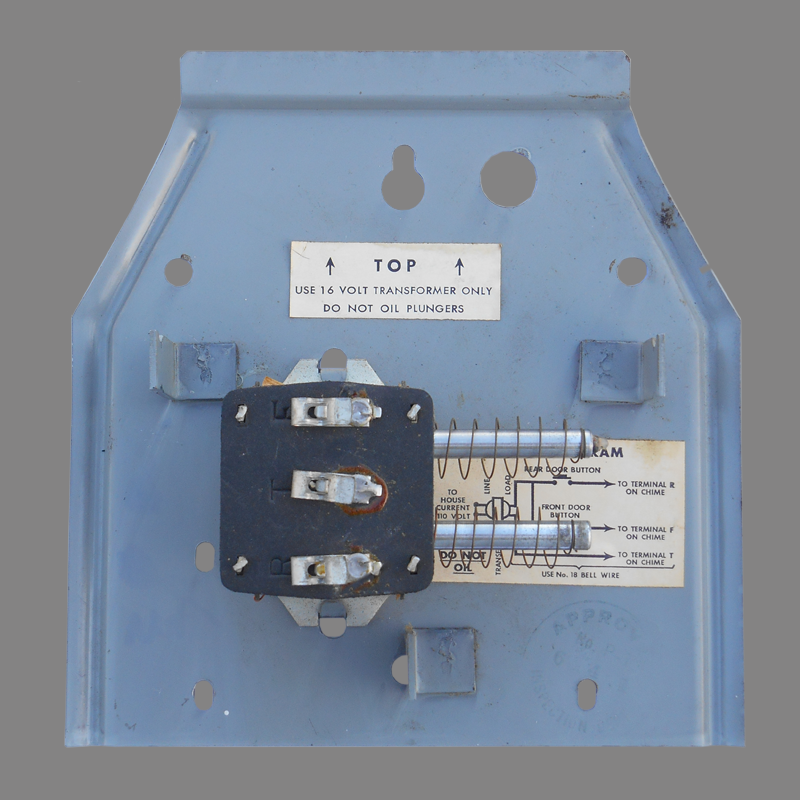 The mechanism back plate is extended at the top to provide an overall height and presence greater than similar chimes. The Serenade is described as follows in Miami-Carey literature from 1963. 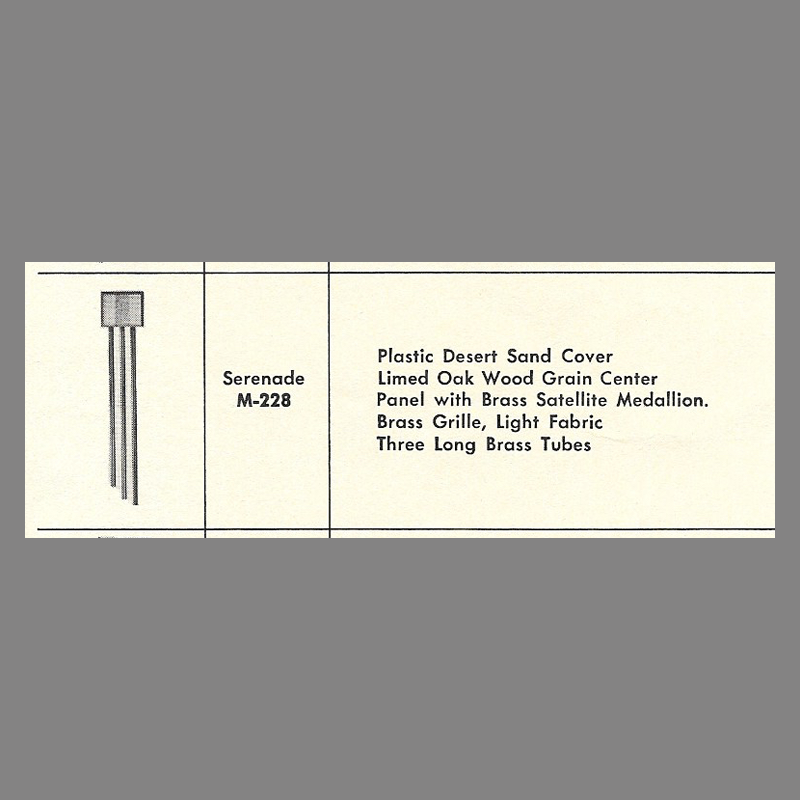 Serenade—Model M-228—Plastic Desert Sand cover, light fabric, limed oak center panel with brass Sunburst (emphasis added) Medallion. Three long brass tubes, 2 notes front door. 1 note rear door. 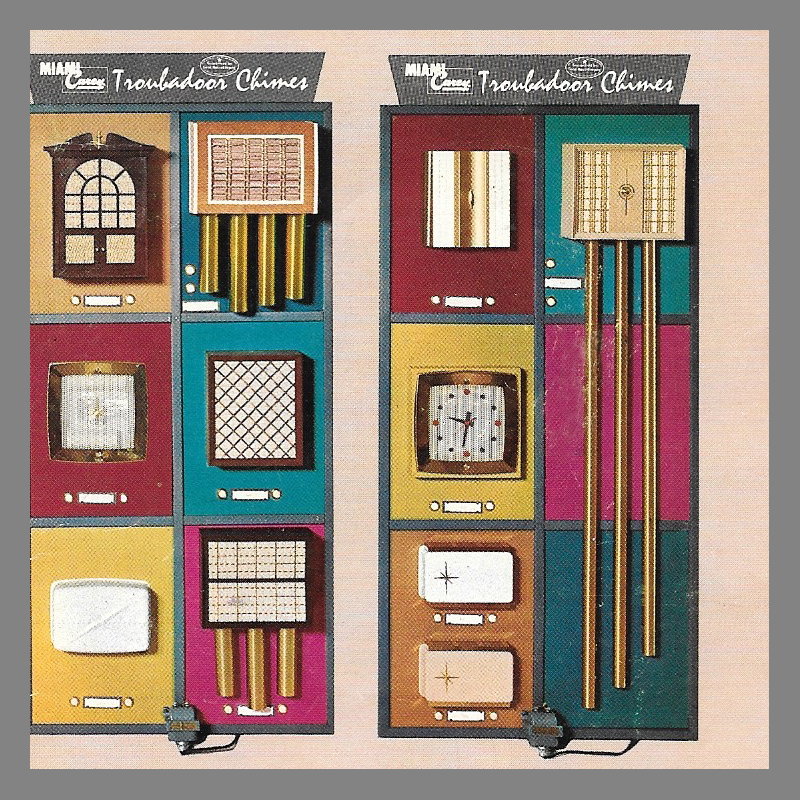 Curiously, the satelite variation was not actually listed in the 1963 catalog although it is clearly pictured in one of the Troubadour Chime Displays on the back cover of the catalog. 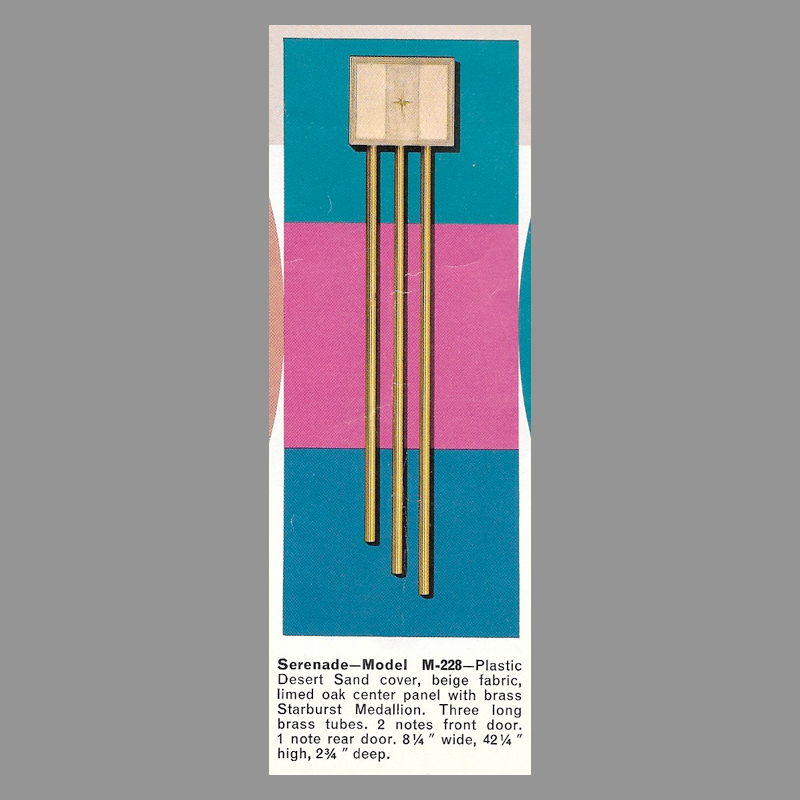 Even more mysteriously, the Satellite Serenade was the only version listed in the July 1, 1963 Miami Carey Chime Line Price List. Perhaps the satellite version was introduced in 1963 in favor of the Starburst or the omission was an oversight. Materials Cover: Styrene plastic, Fabric grille cloth, Limed Oak wood center panel, Metalic Gold Trim. Dimensions/specifications 42 /14 inches tall, 8 1/4 inches wide, 2 3/4" inches deep.